Great for home or small-office use, the APC Back-UPS Pro 500 BG500 UPS protects electronics from power outages and disasters with an energy-conscious battery back-up. The new advanced Lithium Ion technology with 500VA/300Watts capacity keeps your devices - like modems, wireless routers, and voice-over-IP phones - running when the power goes out, while shielding the, from unsafe utility power levels, spikes, surges, and electrical noise. Four outlets are arranged in two groups: two labeled Backup provide full-time surge and battery backup, and two labeled Smart Outlet are configurable for surge and battery protection or surge only. The Smart Outlets support a Watchog function, enabling the automatic reboot of unresponsive network equipment. The BG500 unit can be managed through an USB connection on Windows or Mac OS X, or can be controlled remotely over the network via a standard web browser. A user-friendly web interface makes management and modification easy. 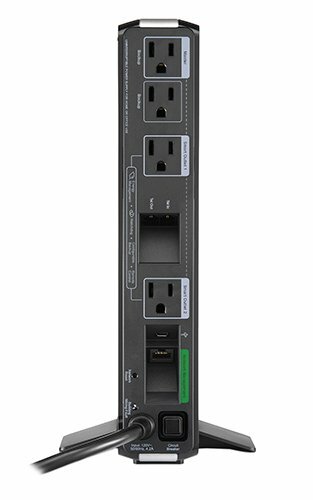 Energy managed outlets save power & money: Turns off peripherals (monitors, printers and etc.) when primary component (computer) is off. Automatically restores power to peripherals as soon as the primary component is turned on.